Although we are a multi-day tour company offering Belize kayak tours (and 14 other sports! ), we offer a few of our one-day inland activities for groups of eight minimum and fourteen maximum. We cannot offer anything to our private island for one day only; the boat ride to the island is 3 hours one way. 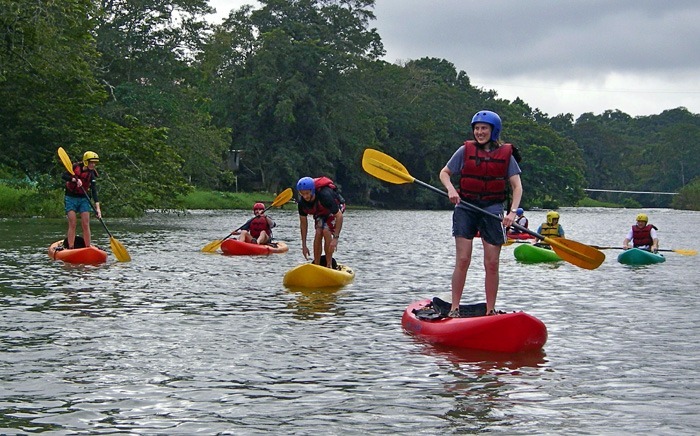 These inland activities are normally offered as part of a longer trip called Belize Adventure Week. Please inquire for the date you are interested in, we can only offer these group charters on certain days of the week during certain times of the year. You can locate all of these one-day activities on one of our free Belize maps. Everyone has heard of Belize cave tubing, but less is known about running the famous Caves Branch underground river by kayak, because few companies have the experience and the equipment. Slickrock has been conducting this underground river run of the Caves Branch River in Belize since 1991, using kayaks to explore this incredible water cavern. The problem with cave tubing in Belize is that the runs have to be extremely short as this river is too shallow to allow an unimpeded float. 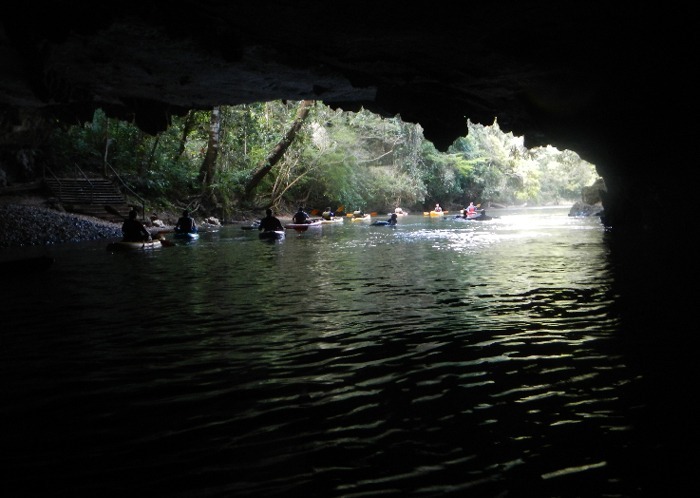 Slickrock Adventures is the only company to use kayaks to run the whole section of caves. If you have time for a 4 day vacation to Belize, our Belize Adventure Week First Half trip includes this one day adventure. The Mopan and Macal Rivers flow together to form the Belize River, one of Belize’s major rivers. Not far above this confluence, our run down the Mopan consists of 5 miles of the river as it passes through the end of a gorge into the valley below the Maya Mountains. The river’s warm, 70 degree water is a beautiful clear green color and the channel is surrounded by huge trees teeming with parrots and iguanas. The rapids we encounter are at a level suitable for beginners, with large pools at the end of each drop. Complete instruction in kayaking whitewater is included in this one day adventure. Lunch is also included at a riverside cafe serving fantastic Belizean food. 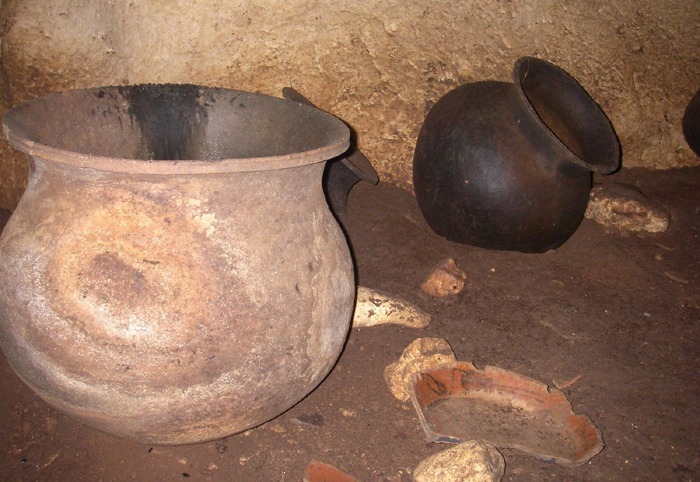 Che Chem Ha cave was discovered in the 1980’s by a farmer searching for palm leaf to roof one of his buildings. His dog chased some game into what appeared to be a small animal burrow. When the dog did not immediately return, he found that the opening was actually a cave entrance. On another day he came back to investigate further and found this huge cavern filled with Mayan ceremonial artifacts. He soon started tours of the cave with the Belize Archaeological Department’s blessing, since it is located on his property. Today one can take a tour with William, the farmer who originally found the site, and see hundreds of offerings the Mayan shamans left after completing their ceremonies. Xunantunich (pronounced “CHEW-nahn-too-neech”) is located just ten miles before you get to the border with Guatemala. This ceremonial center was closely connected to Tikal and Caracol, other nearby Mayan cities. 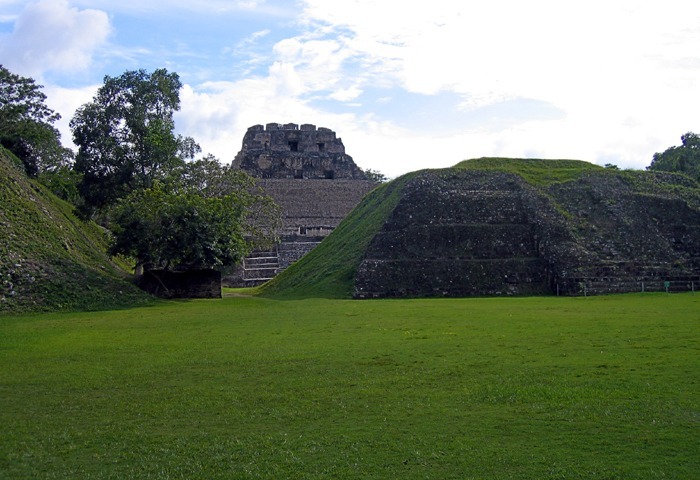 Population here peaked during the Classic period of the Maya and it is home to 25 temples, including the second tallest Mayan structure in Belize. From the top of this pyramid “El Castillo”, one is rewarded with a breathtaking view of expansive jungle.